Departures: Daily – All year around. 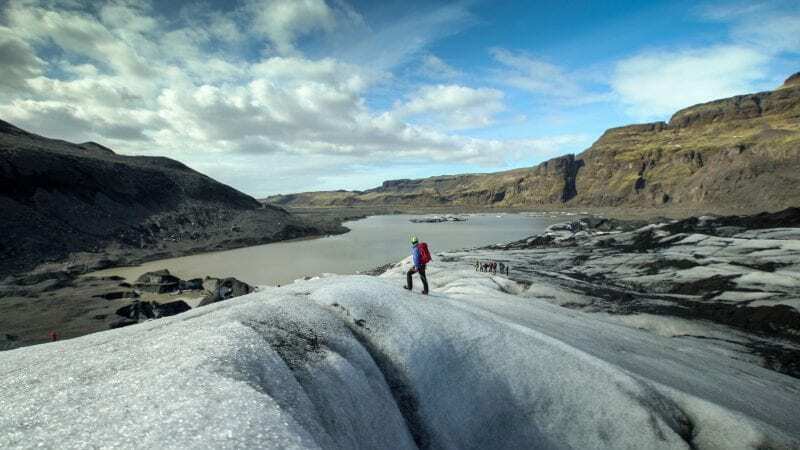 In this tour we will take you to the Sólheimajökull glacier on the south coast of Iceland. It is only about 2 hours drive from Reykjavík, and on the way to the glacier we will visit the magnificent waterfalls of Seljalandsfoss and Skógafoss. The Sólheimajökull glacier is an outlet tongue of the fourth largest glacier in Iceland, Mýrdalsjökull. At the glacier we’ll enjoy the raw and stunning landscape created by the ice, with crevasses, ridges, occasional ice caves, and a whole arrange of ice shapes. During the winter, we may find icy conditions on the areas we visit, and the weather may be extremely windy and cold. Ice walkers can be useful, and warm clothing recommended. Please make on-line booking at least 2 hours prior to the departure. Please note that availability to the Glacier walk is subject to a partner service operator. If the tour is sold out, it is still possible to join the regular South Coast tour or the snowmobiling version. We work with small groups, usually 19 people maximum, so dates tend to get fully booked rather early. Booking in advance allows us to organize the departures, so please, book in advance when possible.